The best memories of raising kids on Cape Cod are centered around the pure joy of the endless summer days at the beach. The bathing suits were on even before breakfast and stayed on all day, long after they were forced to wear an over-sized tee shirt to cover pink shoulders or to keep warm after the sun started to set. The beach was different each day and the opportunity for exploration was endless. While the moms gathered their beach chairs in a circle, the kids were allowed to run and swim and jump off the dock all day, stopping only for an occasional snack or a head count. By the time the sun was setting and the toys were gathered, there was always a bucket full of treasures to bring home . Amid the hermit crabs, quahog shells and perfect rocks, there sometimes was found an elusive piece of sea glass. That was always the most precious find- the blues and greens reflecting the sparkling ocean and the pink and oranges reminding us of the colors of that magical few moments as the sun rises and the excitement of a new day awaits. 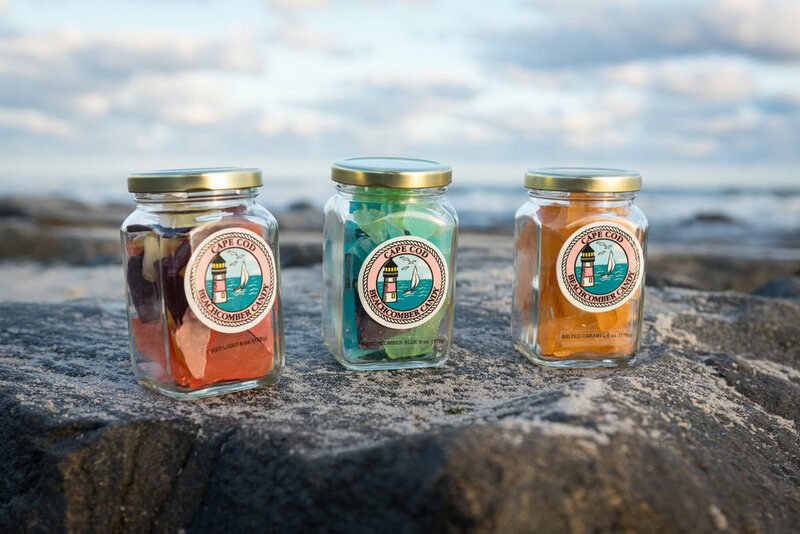 Our Cape Cod Beachcomber Candy brings home the flavors and colors of summertime on the Cape. Explore our three flavors below! Family owned and operated provider of authentic Cape Cod stuffed quahogs.